Most instant messaging client programs saves and stores user ID and password credentials in registry or file location in encrypted form, so that the user name and password can be used to automatically login to the messenger account. For example, Windows Live Messenger (MSN Messenger), Yahoo! Messenger, ICQ and Google Talk all has such a password saving capability. 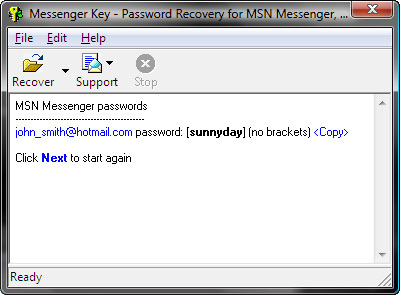 Messenger Key is a software program that helps user to retrieve and recover password of MSN Messenger, Windows Live Messenger (WLM), Yahoo! Messenger, Google Talk and ICQ which is stored and saved by the IM client program locally. And, Messenger Key can recover passwords used within IM client program instantly. Messenger Key is from developer of Asterisk Key, a program used to reveal and recover password hidden and masked as asterisks.